At Metform, we produce cut-to-length lines for gauge ranges up to 0.125”. If the specification requires levelling Metform will incorporate a Bradbury eDrive® Leveler, considered the best in the industry. This combination is only possible as Metform is part of the Bradbury Group of companies. Metform’s specialty is lighter gauge lines designed specifically for customers who want to process their own sheets in-house. We will customize your equipment to meet your specific needs. Designed for customers with low production rates, these cut-to-length lines offer an economical solution that can easily process heavier gauge and non-surface critical materials. 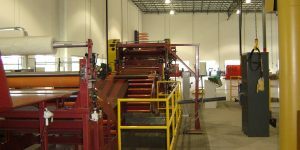 Designed to be versatile and run at high speeds, these cut-to-length lines offer a solution that can process a variety of materials and material thicknesses. 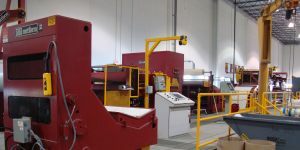 The continuous process of this line makes it an ideal choice for surface critical or soft materials such as aluminum. Designed for high volume and high quality manufacturing such as automotive, architectural product and appliance industries, these cut-to-length lines offer a versatile solution that combines high speed with length accuracy. This design incorporates a precision leveler, accumulation loops and an accurate shear to provide the desired results. 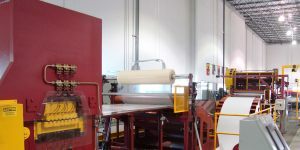 If you are looking to produce several blanks from master coils Metform offers a multi-blanking version which incorporates a slitting head and appropriate blank handling equipment.